Made in small batches, our whisky starts with 100% malted barley (a combination of Pale, Vienna, and Honey malts) partnered with hand-selected yeasts for fermentation. Adapting Scottish traditions to craft a bold new American malt whisky, our experienced distilling team carefully monitors and balances the profile of this product every step of the way. We take only the vibrant heart of the spirit run, barrel in charred new American oak, and bottle to proof in our distillery with the purest mountain water. Never chill filtered, this whisky retains a complexity from the mash bill, along with tones of vanilla and caramel. 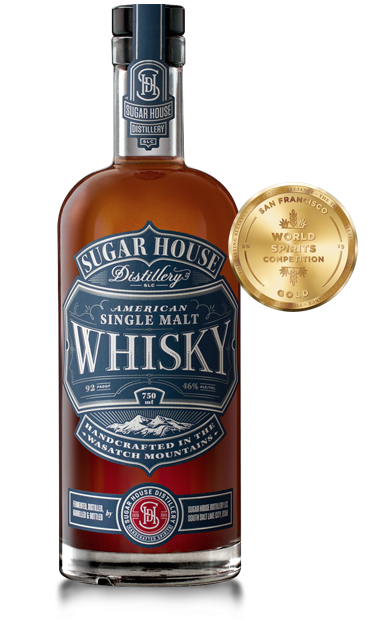 At Sugar House Distillery, we take pride in knowing that the bottle you hold in your hands has had the full and undivided attention of our distillers from start to finish. No outsourcing. No additives. No artificial colors or flavors. Just malted barley, yeast, and time; finished with a little water and a lot of skill. Come by our distillery so we can show you how it’s done.